If you have a strong eyeglasses prescription, we’re not surprised you’ve found your way here researching high index lenses. This incredible lens technology is the number one way for anyone with traditionally thick lenses to slim down their lens profile, increase their visual clarity, and reduce eye distortion. Of course, resolving to get yourself new, fashionable high index will lead to many optional details to choose from. You should now decide not just to increase your lens index, but by how much. The higher you go, the thinner (and more expensive) your lenses will be. Then there’s a material to choose from, as there are several kinds of plastic lens that have been developed for the sole purpose of creating a higher index, but glass can also be made into a high-index lens. So which selection is right for you? If you’ve found yourself in a world of high-index choices, it’s important to weigh the pros and cons of each material for your own personal use. 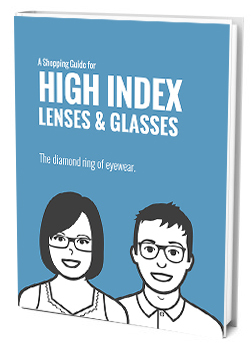 Keep in mind how delicately you treat your glasses, and which aspects of high index lenses matter most to you. Do you need scratch resistance or shatter resistance? Do you want the thinnest possible lenses or just something thin enough to fit into your favorite frames? Then, of course, there’s weight which varies somewhat widely between the material choices. If you’re not sure, keep reading as we break down the fundamental differences between glass and plastic high index lenses. To understand what makes a lens ‘high index’ you will first need the baseline. Original glass and plastic lenses both have an index of about 1.50. This is the index most people are familiar with and tends to produce the ‘coke-bottle’ effect for stronger prescriptions which create thicker lenses. The original high index lenses, polycarbonate to be specific, was discovered by accident in an attempt to make safer, more impact-resistant lenses. By making a denser material, they also increased the index which bends light more efficiently, thus slimming the profile of lenses made with them. Since then, new specific plastics like Trivex, Tribrid, and much more customized super-high-index materials have been crafted to continue refining the high index plastic lens. However, due to the nature of plastic lens production, the index can only go as high as a material has been invented to achieve it. Currently, the highest available plastic index is 1.74 with a material invented by the Mitsui Chemical Co. around the turn of the millennia. That said, 1.74 creates an incredibly thin lens at a full 35% thinner than standard which is more than enough for most prescriptions. Glass lenses, on the other hand, can be crafted to suit almost any index. The nature of glass means it can be melted and re-formed into incredibly thin, almost paper-thin, lenses with indexes soaring all the way up to 1.90 if you choose to go with this option. How thin is a 1.90 lens? If you can imagine it, these lenses are nearly 80% thinner than your standard eyeglass lenses. It is a common misconception that thinner lenses will also be lighter-weight, but this is not necessarily true. To create a higher indefx, the material the lenses are made of must be denser, meaning that you have the about same amount of mass in a much smaller space. Therefore high index lenses are, in general, no lighter or heavier than their normal material counter parts. With this understood, there are a few fundamental differences between high index glass and high index plastic. Glass will always be heavier than plastic, no matter which index you choose. This was one of the major selling points for the original plastic lenses back in the 70s and since then each progressive development in plastic lenses has pointed out the lighter weight as a positive comparison vs glass. This comes into play in two different ways. The first, naturally, is how heavily your glasses weigh down on your nose and ears. The second is your selection of frames. While ultra-thin glass lenses may look amazing, they are often too heavy for rimless frames without support beneath the lenses as well as anchoring on the upper half. Impact force is one of the biggest risks for any pair of glasses. Falling onto a table, floor, or getting hit with a fast-moving object puts both the lenses and the frame itself in danger. While old media and cartoons still depict lenses that spider-web or shatter on impact, most modern lenses will, at least structurally, far outlast their frames. The reason for this is strong, incredibly impact-resistant plastic. In fact, impact resistance was one of the primary reasons the most popular forms of plastic lenses were invented and is one one of the major reasons why all children’s glasses are made with plastic lenses. Glass lenses by their very nature are more susceptible to cracks and shattering after a certain amount of impact. While modern lens crafters can make more durable glass lenses, if the material takes enough of a hit, they are likely to form cracks and possibly even fall to pieces. Cracks can occur in plastic lenses with hard enough strikes but shattering is practically unheard of. While you may think that glass lenses are more fragile overall, scratch resistance is one of the realms in which they far and away exceed their plastic counterparts. Where plastic is a little bit soft, which makes them more durable against impacts, glass is more rigid making them much more resistant to scratches. This means that, in general, plastic is the better choice for children while glass is a better investment for adults who are always careful with their eyewear. Abbe, named after the physicist who discovered it in the 1800s, measures the amount of light dispersion that occurs in a lens material. The higher a lens’ Abbe, the less prismatic light spread will appear within the material as light passes through it. Low Abbe results in random shimmers of color in your vision as you look through glasses. While each material is a little different, in general glass has a greater clarity of vision due to it’s high Abbe score while the variety of plastic lens materials tend toward lower Abbe and greater chromatic aberrations. While judging a pair of lenses, most people only consider the appearance of the world from the inside of the glasses. However, there is another important factor that it’s easy to overlook until you’ve already bought your glasses and finally realize how others see you through them. Eye distortion is how your eyes look when seen through the lenses in “the other direction”. Thicker lenses cause greater eye distortion, meaning that all high index lenses cause less eye distortion as the thinner your lenses get, the more easily your eyes can be seen through them without stereotypical shrinking or magnifying effects. What kind of lenses you choose for your next pair of glasses should be based on your lifestyle and needs. Plastic tends to be more inexpensive as a base material while glass provides more visual clarity. The highest index available for a plastic lens is 1.74, while glass can be made at 1.90. If you are choosing for a child, have a fast-changing prescription, or drop your glasses a lot, plastic will usually be the better choice while glass is better suited to more careful eyewear owners who plan to keep a single pair for many years. When it comes to your glasses, the choice is always a personal one.